My old saddle squeaked more than it usually did on that last morning. We weren’t going far, only down the short trail through the woods behind the house. Marco was thirty-two years old that day, and even though he wouldn’t have minded going further, I couldn’t bear to ask it of him. While his body had once been strong, dappled, and gray, now his back sagged, and his coat had faded to a flea-bitten white. To me, he was just as beautiful then as he was the day we met. Marco was resting in a pile of hay, too weak to get up and run, his small body quivering in fear. Crouching down, I held my hand out until he inched his head closer. As my own eyes met his big brown ones, his soft velvet nose brushed my hand, and I fell in love. From that point on, the two of us were inseparable. I spent more nights in the barn that summer than I did in my own bed. Once he was strong enough, we spent our days outside, playing together for hours until the fireflies flew through the darkness, and Grandma called me in for supper. Life regained a sense of normalcy that had been missing for months, and my grandparents swore bringing that horse home was the best decision they’d ever made. By Marco’s fifth birthday, he towered over me and had lost his chestnut color in favor of a steel gray coat. Dapples littered his back, and I was certain I’d never seen a more handsome looking horse in all my thirteen years. One morning, Grandpa lugged a brown saddle out and hung it over the fence where I was combing Marco’s tail. “You wanna ride that horse?” Grandpa asked. I’d never been more ready in my life. It took a few hours and a lot of patience, but our first ride together felt like magic, even if it looked more like a circus act. Grandpa insisted we take our first ride without any head gear, so I wound my hands through Marco’s white mane and trusted him to take care of us both. He wandered around the pasture, exploring the feeling of me astride his back while I tried to get used to the feeling of him beneath me. The bond between us had never been stronger, yet we had to communicate in a way we’d never done before. We worked hard on that for days. It wasn’t easy. We had our good moments and our bad ones. We had our misunderstandings and even some disagreements, but soon we were taking our very first trail ride together through the hills in the backwoods. When he crossed over a creek, my heart swelled up in my chest, threatening to burst. He danced the rest of the way down the trail. There was something special about those early morning rides. It never felt so good to be alive as it did when we were running through the pasture together, our spirits seeming to soar above us, never stopping until we reached the path in the woods. Most teenagers told their secrets to friends or journals. I told mine to Marco. He knew more about me than anybody I’d ever known. His ears would twitch back in my direction, and I could feel him listening. By the time we’d get back to the barn, I was ready to face whatever the day would bring. We left a lot on those hills; dreams and wishes, fears and pride, dashed hopes and broken hearts. My life had been shattered at eight years old when my parents were killed in a terrible accident, and Marco had helped me become whole again. The year I turned twenty-one, Grandpa died of a heart attack, and Marco helped me pick up the pieces once more. He was my hero. As long as we were together, everything was worth trying. The world could burn down around us, but we would be okay. By the time I was twenty-eight, I was married and had inherited my grandparents’ farm. Operating a farm and raising a family didn’t leave much time for hiding away in the fields with your horse, but it never kept us apart. No matter what important things I had to get done later in the day, I always made time for our morning ride. Every morning, like clockwork, I’d be out in the barn before daylight. As soon as I flipped on the light switch, Marco would gallop to the gate, leaving the rest of the herd to continue grazing in the field. He’d let out a happy whinny as I brought him into the barn, brushed the dust out of his whitening coat, and saddled him up. He lived for those mornings as much as I did. It was more than a simple ritual rooted in nostalgia. I needed to be in the woods with Marco at sunrise, and he needed it, too. By the time Marco was in his early thirties, I knew in my heart that our rides together were numbered. He didn’t always move as fast as he used to, and sometimes he was too stiff to race to the gate in the morning. Marco always wanted to go, but I could tell when he was really up for a ride and when he wasn’t. On the bad mornings, we’d stay in the pasture together. I’d sit on the fence and scratch his neck, chattering on about things that were running through my mind. On the mornings when he was feeling good, we’d saddle up, and go on a short, easy ride through the woods, winding down the same paths we’d been taking for over twenty years. There was a chill in the air on that last spring morning. I worried for his old joints, but Marco didn’t seem to be bothered. Sometimes, I think he might have gone on forever down that trail if I had let him. We returned home as the sun rose over the horizon. 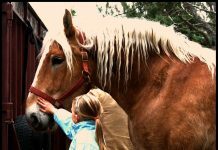 As I unsaddled him and brushed him out, I leaned into his warm neck and took a deep breath, inhaling the sweet scent of dust, pine, and sweat. With a quiet nicker, he twisted his head around, nudging my arm with his nose. I could have stayed that way, he and I together in that old barn for the rest of my life, hugging his neck while the rest of the world spun on without us. But life has a way of coming in and taking over. We lost Marco later that same afternoon to colic. The vet was called, and looking at my dear old friend lying in the same stall where I’d first seen him thirty-two years earlier, I made the hardest decision of my life. “Everything’s going to be okay, buddy. We’ll ride through those hills together again someday, I promise,” I whispered in his ear. We buried Marco at dusk beneath his favorite tree. I sat there alone at his graveside as night fell, and fireflies flew through the darkness.